Coffee is great in any season, but there's no better time to drink hot bean juice than the freezing months of the holidays. And because it's the holidays, you can treat yourself to buying it instead of making it because that's way more festive. Starting on Friday, Starbucks is making this indulgence even easier with a regular discount that revolves around a new, reusable holiday cup launching alongside the company's fresh batch of paper holiday cup designs. 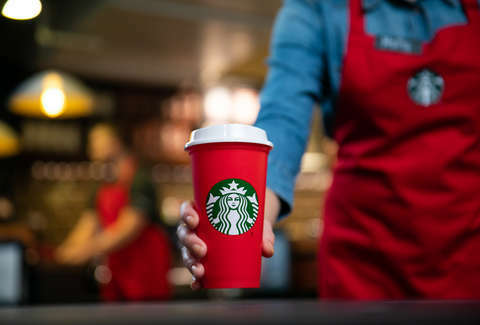 To get your hands on the limited-edition reusable cup, all you have to do is hit up your local Starbucks and buy a holiday drink while supplies last on November 2 and they’ll send you home with one for free. Since it's a good deal, supplies probably won't last, so you should get over there soon. Then, from November 3 to January 7, you'll be able to get $0.50 off grande (16-ounce) holiday beverages after 2pm. That means you won't be getting your morning cup for any cheaper, but you're second (and third) (and fourth) will be a bargain. Starting on November 2, Starbucks is also bringing back its line of holiday drinks. These include Peppermint Mocha, Toasted White Chocolate Mocha, Caramel Brulée Latte, Chestnut Praline Latte, Gingerbread Latte, and Eggnog Latte -- orderable hot, iced, and as Frappuccino blends. All of them will presumably look lovely in a red, limited-edition cup. If you don't manage to get one of these on the first round, maybe someone will get into the holiday spirit and give you theirs.